Spring is a good time of the year to strengthen feet. 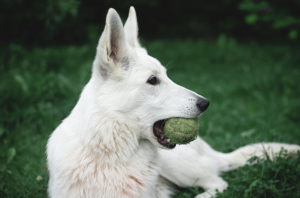 Using a tennis ball is a great way to wake up those foot muscles that have been hibernating all winter while also invigorating the rest of the body. The following tells you why and how! Rolling feet on a tennis ball is beneficial because it allows the individual to be in control of where contact is made with the foot and the amount of pressure to use—it’s a perfect self-care exercise. The size and softness of the tennis ball is ideal because it provides a general surface area for releasing tension in the feet. The smaller the ball, such as a squash ball, which has less cushion, the more specific the ball can be directed to sites of greater tension. Using a tennis ball allows the superficial muscles of the feet to relax, and repetition of this movement gradually reveal sites of deeper muscle and ligament layers of the foot (where often pain and tension reside). Once your feet become accustomed to the ball, eventually you can introduce a smaller ball to direct pressure to more specific areas of tension. Another wonderful benefit to rolling a tennis ball on the feet is its therapeutic effect on the reflex sites that correspond to the body above, and as mentioned before, the smaller the ball the more specific one can be. 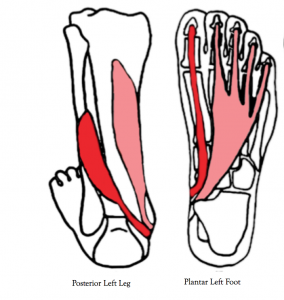 Because of the thousands of nerves in the feet this exercise is very beneficial to the brain and nervous system as it reinforces sensory connections from parts of the feet that have become weak from mis-use. 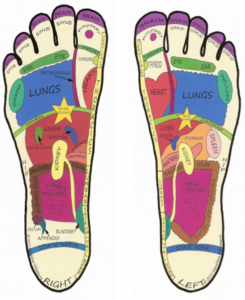 To make it interesting, here is a reflexology map to follow as you roll the ball with the soles of your feet. Bottom of the right and left foot. These images show reflex areas on the feet that mirror the body. How frequently should you massage your feet with a ball to gain these benefits? 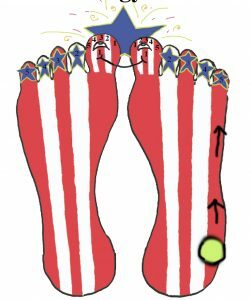 Making the activity of rolling a tennis ball on the soles of your feet a daily event will invigorate not only the muscles of the feet, but the whole body. The improved blood supply brings nutrition to the feet, which happen to be the furthest appendages from the heart. Furthermore, the motion of rolling the feet over the ball engages 13 lower leg muscles that balance and propel the feet. The left illustration shows two of the deep muscles located on the back of the leg that flex the toes. The right image shows where these muscles attach on the sole of the foot. There is such a thing as overdoing, so to avoid harming your feet, tennis ball rolling 2-5 minutes per foot in the morning and/or at the end of the day is sufficient to start. Gradually build your time to 10 minutes per foot, which allows plenty of time to make an impact on restoring and maintaining healthy feet. What techniques might you use to get the most out of your tennis ball-foot massage? Begin with one foot at a time. Barefoot is best–and remember to breathe. Sit in a comfortable chair and place your bare-foot on the tennis ball. Avoid folding your body to look down at your feet. 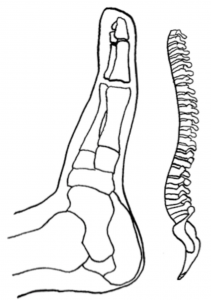 Keep your spine as straight as comfortably possible. Place the ball at the center of your foot and slowly, roll the ball toward the toes and back toward the heel. Let the movement begin in one-inch increments and build on the range of movement until the ball reaches the length between the pad of the foot and the heel. If you lose control of the ball, not to worry- sometimes coordinating the ball takes time-so move slowly. To be more specific, place the ball on the outer sole of the foot at the heel and use pressure to direct the ball in a line of movement toward the small toe. Repeat this from the heel to each toe starting from the outer to inner side of the foot. Be patient- it’s a little trickier than you may think. This is a reflexology technique using a tennis ball. It’s called clearing the zones, which helps to open the energy pathways through-out the body. Note the tennis ball is small to show the visual pathway. Eventually using a golf ball can be very effective. To relax the muscles which attach to the arch, you must take care, as this part of the foot is not intended to bear weight or touch the surface of the ground–so it will be more sensitive. Position your foot so your knee is slightly-angled toward the other knee and slowly move the ball up and down the arch for about 3-5 passes. On a reflexology note, this is very stimulating to the spine of the body as well. 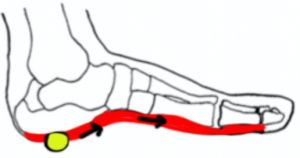 The arch of the foot influences the spine of the body. Notice the similar contours of each. Next, place the ball at the center of your foot and move the ball left-to-right to relax the transverse arch—this area plays a very integral function in how the feet bear weight. It is also the reflex area associated with the transverse colon, which means this motion may help with releasing stagnant bowels. 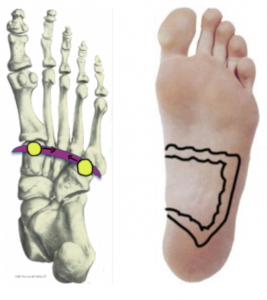 Left image shows the sole of the foot-the purple area indicate the bones of the transverse arch on the left foot. The right image shows the reflex area of the large intestinal tract on the left foot. To strengthen the toes and improve balance, place the pad beneath your toes on the ball and clench your toes, hold for 2-3 seconds, and then release the clench. Do this 5 times. Then, gently place weight from all toes toes on the ball and bend your toes backward, holding for 2-5 seconds. Again, there is reason for caution here, as many of us wear shoes that confine the toes into narrow toe-box shoes and therefore weaken the toes ability to flex and extend. So this may hurt in the beginning. Work with-in your level of tolerance. ***I like to do this exercise last to avoid cramping in the feet and toes. Once you feel comfortable doing these exercises in a sitting position, the “iron-man” method would be the same exercises in a standing position—but it’s not necessarily a better exercise. Be sure to hold on to the wall and keep your head and shoulders back. At the end of these tennis ball exercises, your feet should feel warm and wonderful. You’ll be amazed how good you feel—all over! Slight discomfort may be expected with these exercises, however it should feel good for the most part. If it doesn’t, let up on your pressure to avoid creating an inflammatory response. ***If you cannot bear weight on your foot when standing and walking, meaning you hop on one foot, see your doctor, as this may indicate a stress fracture in your foot which is contraindicated for doing these exercises. This is great information. I’ll share with my reflexologist/chiropractor too. Thank you.